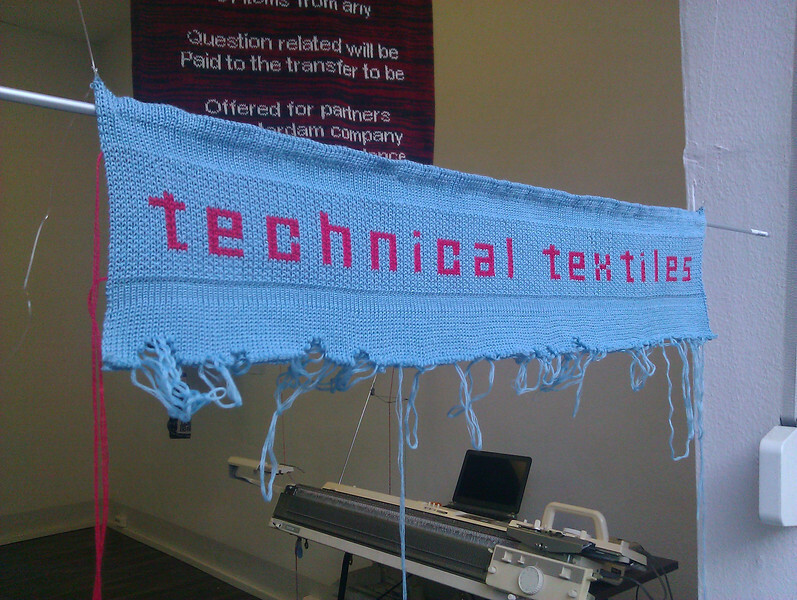 In April here in Berlin, I threw a little textile art show and event with talks and workshops called technical textiles. Thanks to everyone who shared art for the show, threw workshops, and came by and saw some examples of modern uses of older knitting machines and computer scripted hand embroidery. 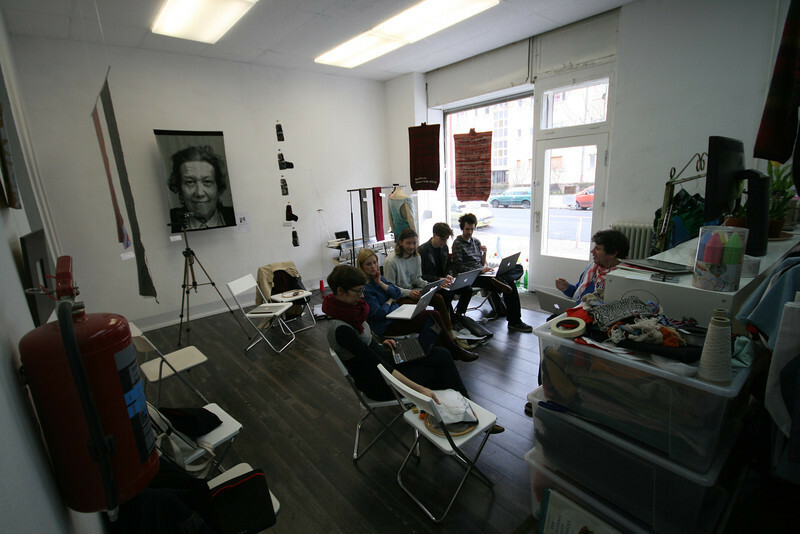 Pictured here below is the gallery show during Martin Schneider’s Turtlecraft Embroidery Workshop. For the show I managed to finish two new pieces with scripted images from algorithmic based seashell generative designs. The first was an orange and blue stole, Cymbiola Vespertilio 00, and the second a black and white stole, Cymbiola Vespertilio 01. The name Cymbiola Vespertilio refers to the mollusk’s shell that is modeled with the software algorithm, the mollusk is also known as the bat volute. 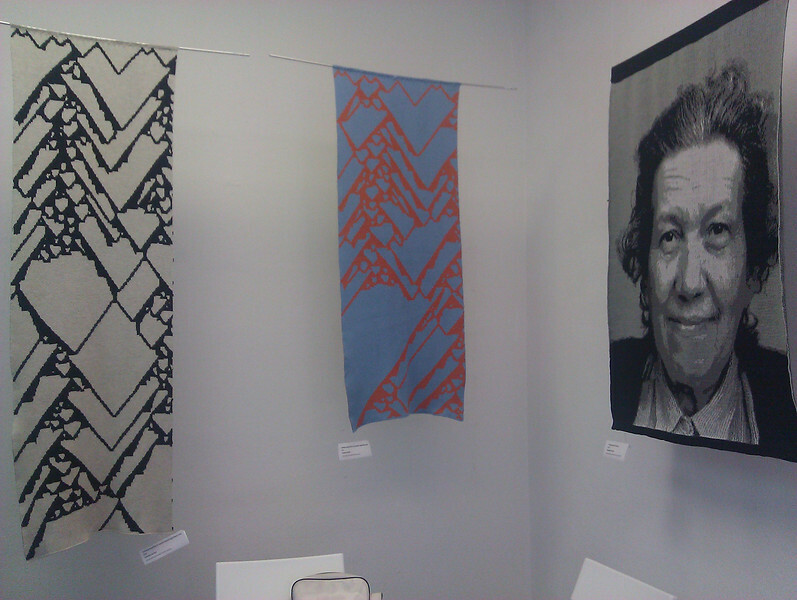 The two stoles are pictured here below hanging in the technical textiles show at etib here in Berlin alongside a knit portrait by Veronika Persché. On June 19th, 2013 I gave a talk at the Humboldt Universität here in Berlin on Knitting machine hacking, in English. You can watch a video of the talk and a hands-on demo with my hacked KH930 knitting machine here on youtube. A video piece about me also about knitting machine hacking (and the orchidarium, now with released source code) appeared in German on Elektrischer Reporter on June 27th, 2013, on the ZDF Info tv channel; the online video is here. 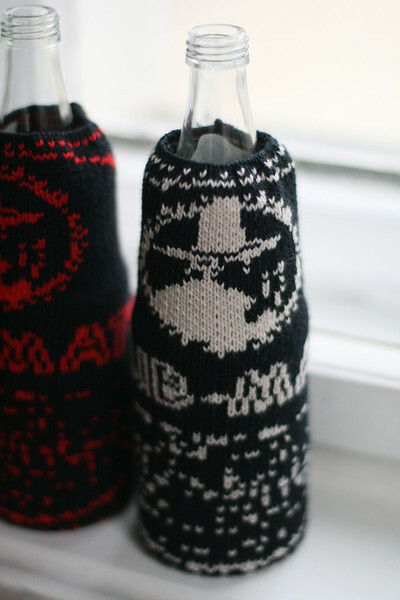 I’m offering a small run of mate cosies: “warm hands, cold mate” for this winter season. Each mate cosy is produced on my hacked kh930 knitting machine, by hand by me (the machine isn’t motorized yet) and then finished by hand by me. They are available in this limited run (probably around 40 pieces total) for a price of 60 euros for either black/white or black/red. If you would like a special order QR code on the front of your black/white cosy, that will cost 80 euros. The QR codes don’t really work very consistently since little knit v’s are not easily recognized as square pixels. They sort of work in the dark. You could improve this by writing a QR code reader filter that “sees” v’s as pixels. 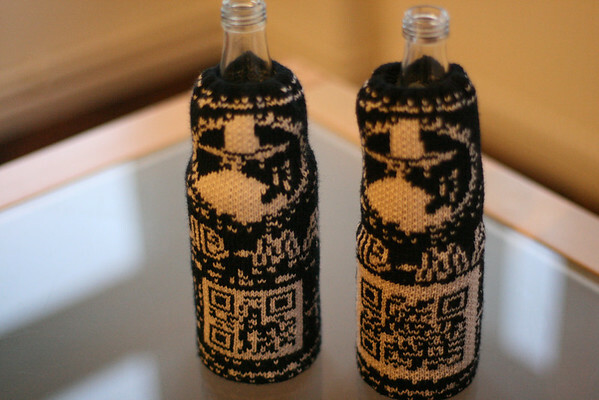 If you are the first to code such a filter, or if you are the first to code up any other means for creating readable QR codes for knitting, and you open source the code, I will give a cosy to you for free. Shipping will not exist, in other words, this is for Berlin pick up only. Payment is either by German bank transfer or by cash in person during 28c3 or during BerlinSides or during BreakFast. This small run of cosies is a bootstrapping attempt on my part to raise money to fund a commercial industrial factory knitting run of 500 pieces of my 1D CA scarf. The proceeds from selling the scarves will raise money to purchase or at least partially purchase an industrial knitting machine myself to hack, open source, and run small knitting production runs locally. So if you purchase one, you are helping to create open-ness in textile manufacturing as well as make my life that much more awesome while I work on this project. To order a mate cosy, drop me an email to fabienne at the name of this website. Please specify color (black/red or black/white) and/or QR code (black/white only). QR codes are available up to 25×25 (QR code Version 2) but I recommend QR code version 1 in 21×21 pixels. For the QR code, please don’t submit more than error correction L (the lowest) because it won’t help. The mate cosies will be sold on a first emailed (don’t play with your email headers, geez), first payed, first served basis. That means that I will email you back with a confirmation and the information on how to pay to secure your cosy. Quite a few thank you’s are in order for even this small run: Marcus Loscher for ok-ing a small run of these related to his company’s delicious product club-mate, Lisa for her suggestion that I put a hand-warmer in the cosy, (thanks! I did! ), Astera for her help in testing prototype four, Travis for his never ending help both in our crazy drive in November of 2010 to pick up the machine and our subsequent four days of no sleep and his support since then on software and hardware which we will be able to offer as a kit in the future, Skytee for his testing and de-busying of the pattern suggestions, LadyAda and Becky Stern and Steve Conklin for open sourcing and documenting their knitting machine efforts which allowed us to extend the hack, Jimmie for helping test QR code reading and error correction levels in double bed jacquard knitting, Steel Breeze for her help in documenting double bed jacquard and hands-on help with carriage setting, and the lovely machine knitter people who helped on the knitting machine boards on Ravelry. Now for some hypertransparency! 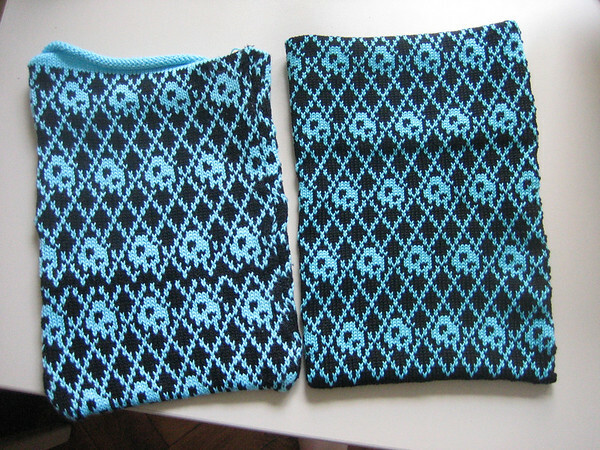 The cosies take about 2.5 hours each of my hands-on time to complete. The yarn for the cosies is Hamburger Wollfabrik “Pretty Woman” 60 percent extra fine merino, 40 percent acrylic. That means these cosies are machine washable cold on a delicate setting, but I recommend hand washing cold first with a bit of wool-friendly detergent in case the dye runs a bit. Each cosy uses 83 grams of wool. 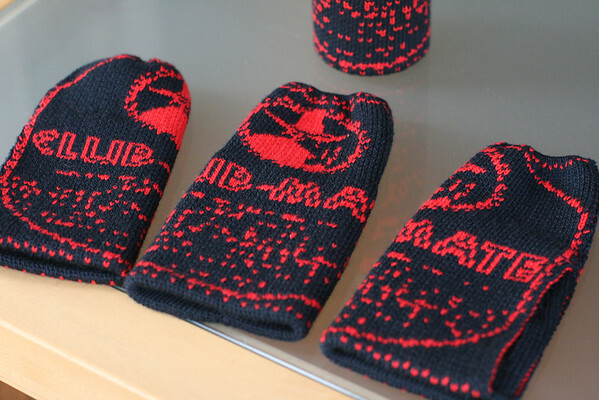 The black/red cosies use 60 grams of black, 23 grams of red, with 28 grams of the black in the ribbing. The black/white cosies use 32 grams of black, and 51 grams of white, with 28 grams of the white in the ribbing. Each cosy uses about 3.34 euros of wool. The largest cost with regards to this production is obviously my hands-on labor. With the way knitting machines work, this hands-on production cost is not possible to reduce without owning or having access to an industrial knitting machine instead of my lovely but limited hacked consumer kh930 knitting machine from 1981. Even if I were to machine sew some of the seams, it wouldn’t speed up the time of hand casting off the gathered edge at the very top of the cosy, and the seam to the inside of the ribbing to the main body needs to be blind stitched in the double backing (not possible with a sewing machine). All that means is that I’ve made these as stream lined as technically and humanly possible, but it still takes a mini sweatshop style production on my part to produce them. Mate Cosies by Fabienne Serriere is licensed under a Creative Commons Attribution-ShareAlike 3.0 Unported License. Requirements: Brother KH930 hacked, Brother KR850 or similar double bed, Brother double bed color changer (KRC900 or similar). Cast on 38L, 39R on the main bed and 38L, 38R on the double bed, as for ribbing with the needles offset. Set the yarn mast tensions to +1. Set the tension on both beds to zero, set the double bed to extra firm with the II lever to the right, and cast on right to left with your ribbing color (black for black/red, white for black/white). Hang your double bed cast-on comb and add weights. Change the top carriage to slip left with the left part button pushed in. Change the bottom carriage to slip right with the right part switch pushed up. Change the extra firm lever on the double bed back to I. Change the tension on both beds to 1. Knit 3 circular passes (l-r, r-l, l-r) ending on the right side. Change both top and bottom carriage to ribbing setting by canceling the part buttons. Knit ribbing for 65 rows. Hang extra claw weights on the edges of the knitting. With the carriage on the left, set your 77 wide by 96 stitch long pattern in the knitting machine’s memory with your hacked machine setup or with your proprietary computer link. Use a pattern that is simply two color, the kh930 will automagically explode it to double bed jacquard with the KRC key. Press the KRC key. While on the left, set the main carriage to KC(II) and set tension on both beds to 3. Push the carriage past the left turnaround mark, load in your main color (for both of my cosies, that color is black) and pull the carriage from left to right once across the bed. Now set the main carriage to slip in both directions, leave the KC(II) knob selected and set the double bed for birds-eye backing by setting both slip levers to P.R, select both the left and right “lili” knobs to “lili”, and set the tension lever to “lili”. You are now set up to knit double bed jacquard with an auto-backing in a mechanically defined birds-eye pattern. As you push the carriage across to the left towards the color changer, the display on the kh930 will tell you the next color (1 or 2, main or contrast, black or white, black or red) to chose in the secondary seven segment display. Continue in pattern until you have knit all 96 rows of your pattern, moving the claw weights up every 20 rows or so on the edges. When complete, the machine beeps. You will now have the contrast color and be on the left, change to the main color (black). Reset for ribbing (full needle rib as for the first half of the pattern) and clearing all the part buttons on the top and double bed, set the main carriage knob back to N.L, clear the “lili” knobs on the double bed, set the double bed tension lever back to I on the left, set the tension on both beds to 1. Knit two rows of ribbing in the main color, ending on the left. Use the color changer to change to the contrasting color or waste yarn, and knit 4 rows to perform a scrap off cast off. Cut your yarn, remove all weights, knit the carriage once from right to left to release the knitting from the machine. Cast off by hand with the tail of the main color (black) by stitching through each stich, front and back, of the black row. It’s easiest to do this two stitches at a time, run a tapestry needle threaded with the black tail through the top of the back (purled) stitch from the front side of the fabric, then through the left edge of the front (knitted) stitch. Repeat across the top of your fabric, lightly tugging to gather the top edge of your Mate Cosy. When you have sewn through all the live black stitches on the top edge, unravel your four rows of contrast/waste yarn until the left, and use the tucked in stitches as extra strength for your gathered edge. Trim off the excess contrast yarn, leaving a tail as long as your main color cast off tail. Next, fold the ribbed part of the cosy up against the back of the cosy. Blind stitch the ribbing down along the cast-on edge. Next with an extra length of your main color (black), stitch from the cast off edge down the right side of the back of the cosy. Use a standard knit seaming technique of your choice. Stop when you reach the ribbing, and stitch a few top stitches holding in the ribbing, the edge of the cosy and tuck in the ends of your stitching back and forth in the lining for strength and cut the yarn. 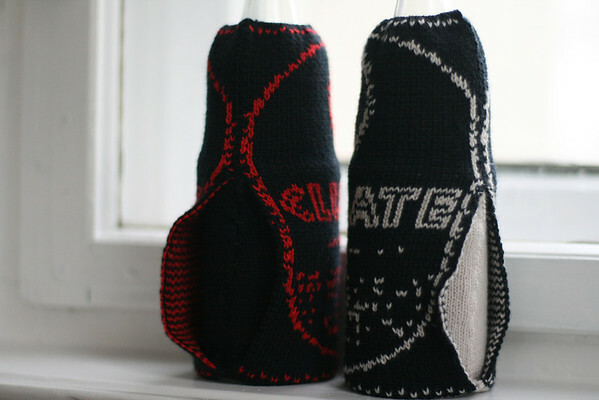 Taking yarn the color of your ribbing (black for black/red, white for black/white), place your Mate Cosy over an empty clean bottle of mate. Stitch the ribbing tightly into place starting at the top of the ribbing and work your way down to the bottom of the cosy. Insert a piece of flat elastic in the bottom folded-over edge of your cosy. 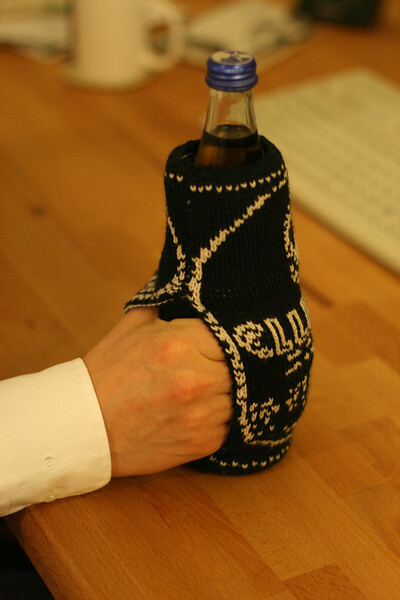 Tie or stitch the elastic to itself to keep your cosy snug and tight on the bottom of the bottle. Stitch a few finishing stitches on the bottom of the hand-hold area of the cosy to hide the elastic. Remove the Mate Cosy from the bottle, and thread both the main and contrast gathering yarn tails at the top of the bottle on your tapestry needle. Gently pull the yarns to gather the top of the cosy to slightly larger than the circumference of the place on the bottle where the top your cosy will sit. Be careful to not break the yarns while gathering. Stitch the yarn tails back and forth in the lining to strengthen the gather and keep it in place without a knot. Congrats! You now have warm hands and cold mate! 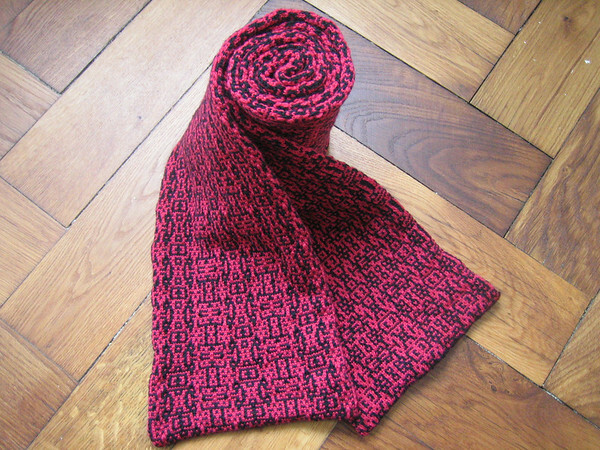 Fresh off the knitting machine is this algorithmically morphing scarf with a pattern that changes by one pixel in each repeat. The software was made by Laura Kogler and used by me with the hacked Brother KH930 I currently have. Laura Kogler’s pattern generator script is meant for mosaic knitting but I knit it as a standard two color fair isle pattern on my KH930. Knitting mosaic or slip-stitch on the KH930 is very operator intensive. 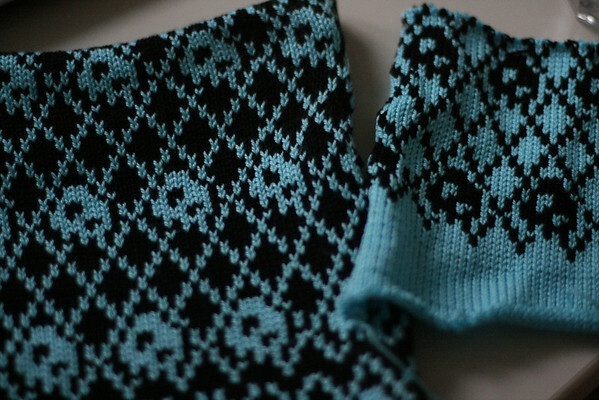 It’s much faster to knit fair isle on the machine. 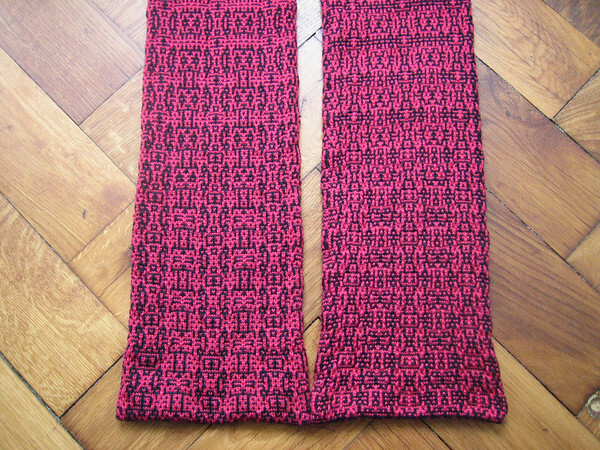 It is a two-sided scarf with one side black on pink and the other side inverted with pink on black. I hand-seamed the whole thing together (which took days) and kitchenered the ends. It is knit in Hamburger Wollfabrik 3-ply Merino in a dark pink and black. It’s incredibly warm and soft, beyond the general nomminess of the algorithmically generated morphing pattern. The scarf has it’s own ravelry page. 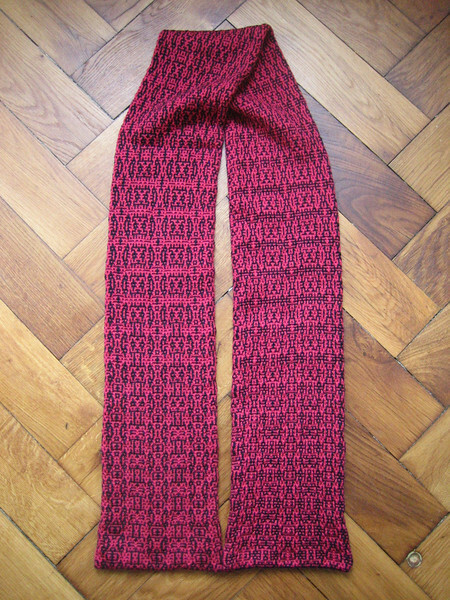 The output pictured above is 7 repeats wide, but I knit it 3 repeats wide for each side of the scarf. Each repeat is 26 stitches (pixels) wide, and the total length of the file sent to the knitting machine is 361 stitches (rows, pixels) long. I flipped the pattern upside down for the second half of the length with the KH930’s built-in pattern flipping functions. 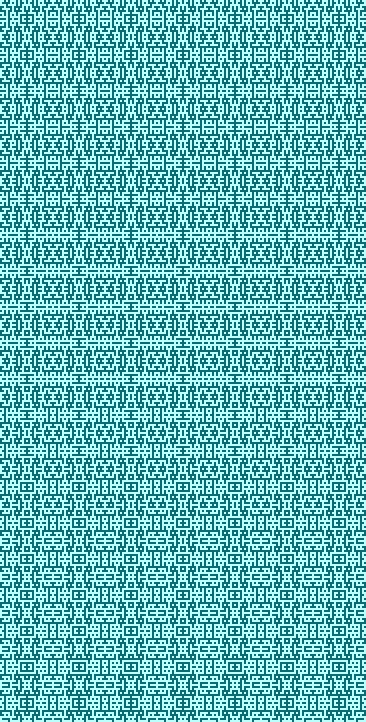 I’m working on some general open source scripts for generative patterns for knitting machines, and so far I have thrown together some Processing code for creating random blocks in definable sizes: http://pastebin.com/ysm8zptS. Eventually I hope to have some general open source algorithmic tools for the knitting machine to allow you to create much longer pattern morphs where the pixel mutations are more prominent. I also am writing in some auto-fill tools to add in patterns to blank areas in picture knitting so they turn out better with two-color knitting on knitting machines. The other killer feature will be to have options to limit the amount of repeats of one color in one row, to keep floats short on the reverse side of the knitting. Happy knitting to all you warmth-creating people out there! 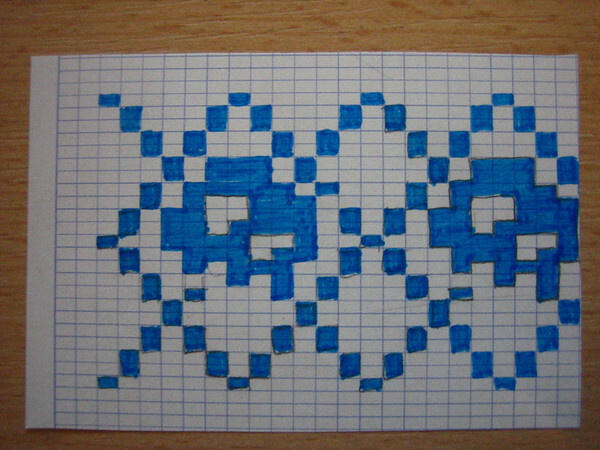 In February of 2007 I worked out an argyle pattern based on my blue skull logo (see graph paper drawing below). 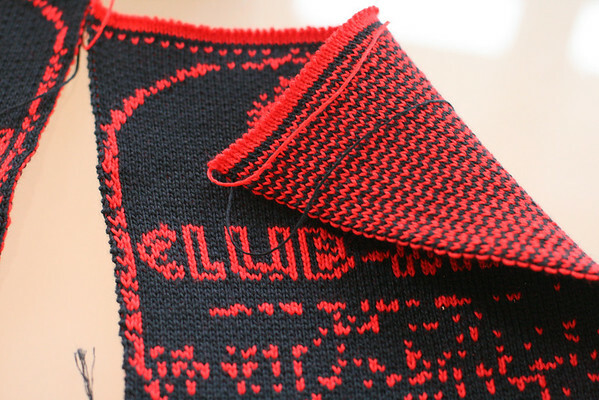 In June of 2008 I knit the two color pattern up by hand (see shot in front of graffiti above). 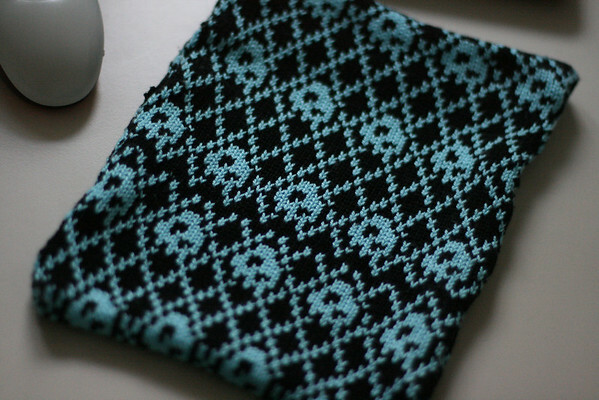 This week, August of 2011, I knit my skull argyle on a hacked knitting machine (Brother KH-930, documented here, code on github here). Sometimes it takes years to complete a project, especially if a project requires a new machine with which to make it. 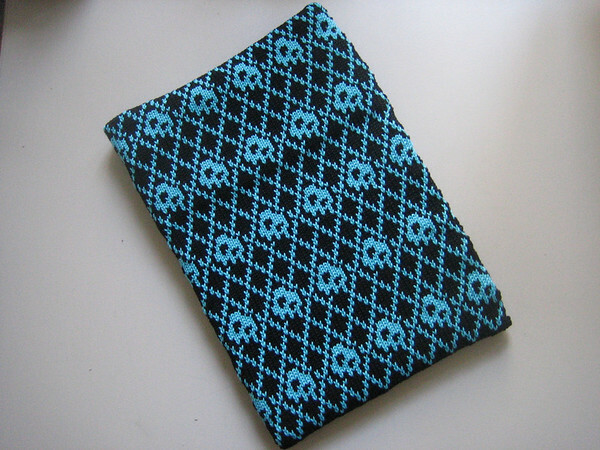 The finished ipad sleeve (see images below) is knit from cotton on the hacked KH-930 (with computer control) and finished with a sewing machine. It isn’t all that complex, and is drawn pixel-wise on the Gimp and exported to the knitting machine with some code to emulate a TDD Tandy floppy disk drive, a bit of hardware, and some code to parse the resulting bitmap into a format which the knitting machine will recognize. This happened during cccamp11 where I had brought the knitting machine to demo in the HXX hardware tent. In the process I have learned all about the mechanics of knitting machines, their capabilities, how to get them to be computer controlled and the yarns that knitting machines like. In the end, I really still hate hand knitting two color stranded patterns, but I love the way the finished products look. The machine gets to offload that burden and still output beautiful pieces. Now that I’m up and blogging again, I just wanted to extend a huge thank you to the knitters in my life. 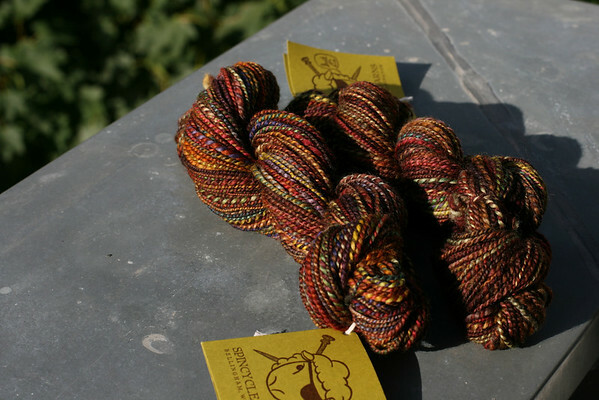 Firstly, pictured above is some of the gorgeous PigeonRoof Studios fiber gifted to me by the ever-awesome Ms. B. 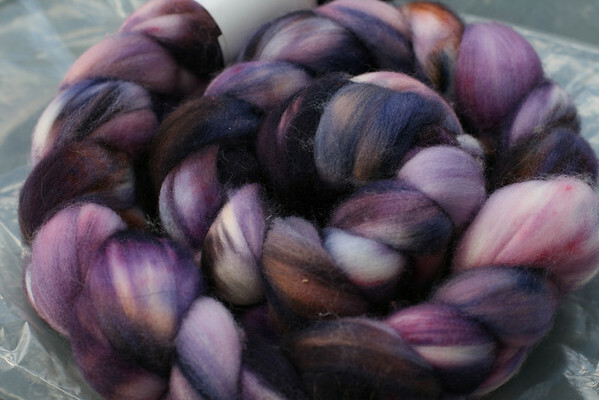 That and another blue roving made their way into my stash so a huge Thank You for those! Secondly, I have been gifted a bike from Erin as she was leaving. What an amazing gesture! Thank you Erin!